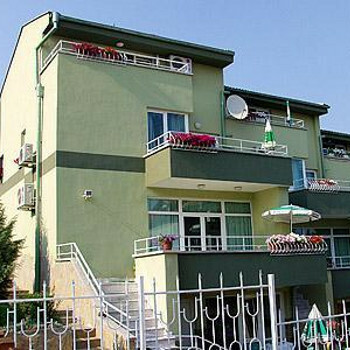 The Flower House Apartments offer comfortable air conditioned accommodation during your stay in Sunny Beach, Bulgaria. Guests also have access to the restaurant and outdoor pool with children's section just 15 metres from the property. Have stayed in these appts/studios 3 times now and would highly recommend them. When we first visited there was nearly nothing surrounding them but now there is hotels blocking most of the views of the sea and a supermarket a minutes walk away. I give it 3 for location but this is because some may like the seclusion but some may be horrified by the quietness of the area, anyhoo you are only really 5-10 minutes to walk the hubbub and 5 mins to the beach. There is nothing here apart from your own lovely garden to chill in (plenty plants and flowers even a grape vine). We stayed in room A3 on each occasion, this is on the ground floor but never had a problem with any bugs. Have been in may to august and my girlfreind has always been a little chilly at nights even on the warmest days so she suggestS a sweater or suchlike. Back to the appts you may not ever see the owner apart from when you arrive, therE is no reception as such but there is a board to the rear of our appmt giving you details of the resort,excursions, flight times and suchlike. You can see a rep if you need to at the close by hotel Sunrise you also have the use of the pool there, the rep if you have one should inform you of this. The appts have no safety boxes and the first time we went this was a concern, we needn't have worried, one night when I lazily threw my shorts on the floor the next time I saw them they were hanging outside to be aired my crumpled notes had been straightened and placed on the table my change piled beside it, the shorts were later found folded in the wardrobe. The maids have always been nothing less than oustanting even doing the dishes when we've had some, we have always left with hugs, kisses and waves. We left around a pound per day as a tip on the last day of our holidays and have really short changed these wonderfull women. This only my opinion and as I have found are only that someone elses opinion everyones will be different but these appmts didn't have a reveiw and certainly they and the maids really deserve a positive one. Enjoy Sunny Beach.